During my prior membership on several of the City’s Boards and committees, I became fascinated by the intricate workings of city government. The degree of expertise required (by the sum total of paid staff, elected officials, and volunteer constituents) to run a city like Ridgeland is simply enormous. When the original opportunity arose to possibly represent such a wonderfully diverse part of our city, I decided to run for the Ward 1 Alderman position. Serving for more than three complete terms of office has been a tremendous honor and source of satisfaction for me, and I’m very thankful that I’ve had this wonderful opportunity to serve the good people of Ridgeland. Experience gained during the last few years has certainly reinforced my original belief that citizen and overall community involvement is key to good planning and implementation of the city’s goals and objectives. I have repeatedly seen excellent examples of elected officials and their constituents working together, to achieve an end-product that is most beneficial to the city and its residents. 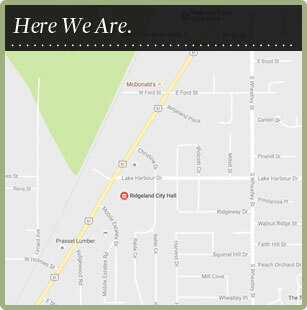 My vision for the future revolves around seeing Ridgeland grow at a pace consistent with “good” growth. Getting things right the first time is far easier than undoing mistakes, and helps maximize our potential for greatness on the front end. With the recent adoption of the City’s Master Plan, the next few years will absolutely be a crucial time-frame in the history of our city. I want to continue helping Ridgeland become the best it can be, always unified in its main direction of growth and development, while carefully guarding the great diversity and charm that it now enjoys.